Over the past two months, second grade students in the Building Bridges with Books program, a partnership between the Free Library and the School District of Philadelphia, had a chance to learn about the culture of one of Philadelphia’s Sister Cities: Florence, Italy. These engaging storytimes and workshops, led by an experience Italian educator, Dr. Anna Mattei, were developed in partnership with Citizen Diplomacy International of Philadelphia. Over the course of three workshops at Ramonita G. de Rodriguez Library, Queen Memorial Library, and two classroom visits at James R. Ludlow Elementary School, five classes heard about traditional Italian folklore. They listened to retellings of "The Legend of Old Befana" and "Strega Nona," learned about the holiday of Carnevale and were able to hold Carnevale masks, discussed similarities and differences between Florence and Philadelphia, and sang "Ring Around the Rosie" in Italian. 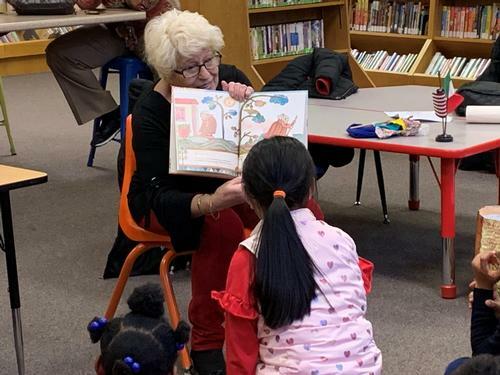 Liz Gardiner, the Queen Memorial Library Children’s Librarian and Branch Head, said, "It was a pleasure hosting a special Sister Cities program at the Queen Memorial Library. Delaplaine McDaniel Elementary School’s second grade classes were treated to an amazing multicultural experience, learning about our Italian sister city Florence’s language, customs, and more. Dr. Mattei, our knowledgeable presenter, wowed the kids with the fact that she’s been knighted by the president of Italy for her services as a cultural ambassador, and then shared the traditional story of La Befana!" The five workshops were created and led by Dr. Anna Mattei, a native of Italy and the president of ITALICA Arts & Education, Inc and board president of the Tolentine Community Center Foundation. Dr. Mattei found sharing the culture and traditions of Italy with students to be overwhelmingly positive: "It was truly a wonderful experience! 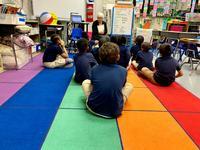 The librarians were so helpful and the children so attentive!" 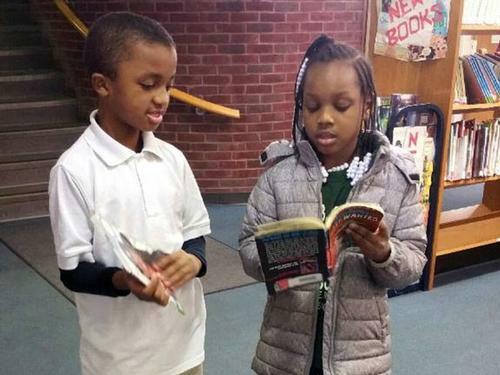 The Building Bridges with Books program, which seeks to lift literacy and develop stronger connections between elementary schools and neighborhood libraries across the city, will be coming to a close this Spring. But the Free Library is always available to connect with and support your schools through engaging literacy experiences like these! Visit our School Partnerships page or email schools@freelibrary.org for more information. Students check out their own library books during their school-day Building Bridges visit to Joseph E. Coleman Library.